About | Sweet Home Inspections, Inc.
Sweet Home Inspections, Inc. has been performing inspections since 2000. From the start we have provided a computer generated, narrative inspection with pictures, that is fully compliant with the Standards of Practice and Code of Ethic of the American Society of Home Inspectors (ASHI). Sweet Home Inspections is covered by Errors and Omission Insurance that protects our clients and their real estate agents. Our inspectors are required to earn over 30 continuing education credits every year to ensure they are always up-to-date on the latest trends and technology in home construction. We are not the cheapest inspection company in Kansas City, nor do we try to be. Our focus is on providing value for our clients. We provide thorough inspections, and personal service to our clients for a fair price. There are many companies in our area where the inspector is only part-time, often they do not carry liability insurance, do not belong to professional associations, and are not professionally trained, nor do they invest in continuing education. The old saying, “you get what you pay for” is very true when it comes to home inspections. Our priority is to give you a value-based inspection for the money you pay. Our clients have found that it has been more that worth it. Sweet Home Inspections was founded in 2000 and has completed thousands of property inspections in the greater Kansas City area. We use the best of the latest technology and methodology to give you an outstanding inspection. Our inspectors maintain required licensing and certification as needed for Kansas and Missouri. 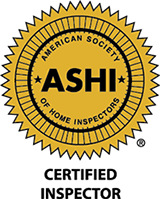 They are all members of The American Society of Home Inspectors (ASHI). Our inspectors are also certified by the National Board of Professional Home Inspectors (NBPHI). The NBPHI is the same examination board that is used in many of the 30(+) states that administer certification/licensing exams to professional home inspectors.